People argue that it pays to be green by helping the planet. However, EcoPlum has a different form of payment in mind. Not only does a green lifestyle help the environment, but buying green products from the website also earns you rewards that can be used to generate discounts on future purchases. If you asked Gia Machlin, at her website it literally pays to buy green. Gia created EcoPlum to offer one stop shopping on green products, but she offers so much more. Besides a variety of amazing products, she also offers a collection of “EcoInfo” that is published on her page. It is literally a one stop location for finding exactly what you need. I recently asked Gia a few questions about her business and the inspiration behind it. Tell us a little about EcoPlum. 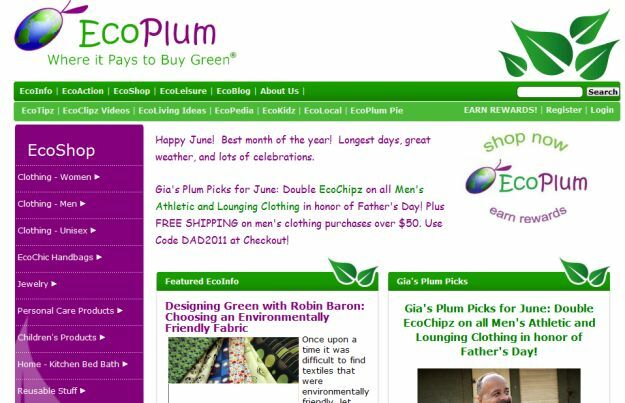 EcoPlum is the green shopping rewards site that makes it easy, fun and rewarding to go green. We inform consumers about green living and eco friendly products to help them make responsible choices every day. Shopping at EcoPlum earns EcoChipz rewards, redeemable for coupons to our shop or donations to environmental causes. Gia and EcoPlum have been featured on Green is Good Radio, WOR Talk Radio, Crains’s New York, and in many other business publications. One day I was thinking about how to get more people to live green lives. I was frustrated that more people did not recycle and purchase eco friendly products. I thought that there should be some kind of rewards program for going green that would give people incentive to be more environmentally friendly. Unfortunately, there were no such rewards programs out there. So, I decided to start EcoPlum, Where it Pays to Buy Green. What are some of the products you offer? We carry eco friendly clothing for women and men, including athletic wear made from recycled plastic, eco-chic handbags made of upcycled materials, organic and natural personal care products, fair trade jewelry, childrenâ€™s products like backpacks made of recycled water bottles, and items for the home such as glass straws and reusable shopping bags, and much more. What type of criteria must the products listed in your shop follow before you will post them for sale? All products sold on EcoPlum are screened carefully for their environmental benefits. We require that they are certified or approved by one of the eco-labels we have selected, or are made primarily from recycled or upcycled materials. We also sell products from companies that have been approved by Green America. What separates your shop from the competition? We offer a unique Green Shopping Rewards program. Purchases in our shop earn EcoChipz points and can be applied, like coupons, toward the cost of any of the products we sell or the points can be â€œcashed inâ€ as donations to environmental causes we support. Our products are carefully selected and have recognized eco-labels for the most part, or are comprised of recycled materials. EcoPlum also publishes original articles for our customers on all kinds of topics that inform their purchasing decisions and help them go green. Our writers are accomplished experts in their fields. Do you have any plans to add new products in the near future? If so, what can we expect? We are adding new products all the time. In the past 3 months alone, we have added handbags made of reclaimed fabrics and materials from Basmati Bags, a natural skin care line for teenage girls called Good for You Girls, backpacks made of recycled bottles from Bennu, and a new line of recycled jewelry from Shanti Boutique. Our goal is to add at least one new product line a month. We are focusing on expanding our offerings in the area of childrenâ€™s products, home goods and personal care products, but we are always looking for great new eco friendly products. What are some lessons your business has taught you? This is my 4th start up, but it is my first with a social mission and aimed at consumers (as opposed to businesses). Itâ€™s a little more challenging to grow a business with a social mission because of sometimes competing interests. We always put the social mission first, and that doesnâ€™t always align with profit and growth (although many times it does!) Also, selling to the public requires a completely different approach than selling to businesses. Itâ€™s taken me a little time to figure this out and adapt my approach. I love what I do. There is nothing better than getting up every day and feeling like you are touching people and making a difference in their lives, and hopefully making the world a more livable place for our children! Do you have any advice that you’d like to offer fellow entrepreneurs that are just getting started? Know how you define success for yourself and donâ€™t get caught up in how other people define it. For me, it is the right combination of money, lifestyle, personal fulfillment and contribution to society. Knowing this helps to guide my decisions and align my personal and business goals.